Restylane treatment - Центр эстетической косметологии "Путь к совершенству"
MODEL RELEASED. Restylane treatment. Image 4 of 8. 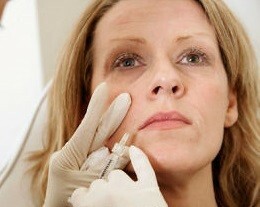 Clinician injecting a female patient’s upper lip area with Restylane. Restylane, a biodegradable gel based on hyaluronic acid, can be injected into wrinkles around the mouth. This lifts up and smooths out the wrinkles, resulting in a more youthful appearance. Hyaluronic acid is the protective fluid found between joints. See M590/282-289 for a Restylane treatment sequence.